FlamBICC cables ... Ducab has built a laboratory for testing these fire-performance cables. 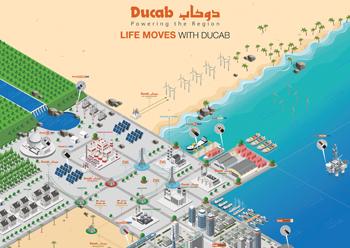 Ducab has grown to become a global leader in the development, design, manufacture, marketing and distribution and stakes claim to being the only plant in the region to supply copper and aluminium wire and cable products for the energy, general construction, industrial, defence, transport and specialty industry verticals. Over the past year, the company has recorded steady growth in terms of product diversification and geographical footprint, and supplied projects that have generated approximately $1.5 billion revenue in 2017, Ashish Chaturvedy, Ducab’s marketing manager tells Gulf Construction. The company has also introduced product lines designed for specific sectors, and this innovation in product expansion has contributed significantly to increased market penetration, he adds. Chaturvedy ... rising revenues for Ducab. Ducab has long been a pioneer in the region’s cable industry, renowned for its variety and quality of cables. Bearing in mind the social and economic transformation being planned in the Middle East, the company has evolved its business model to understand the specific needs of customers and deliver products and services accordingly. 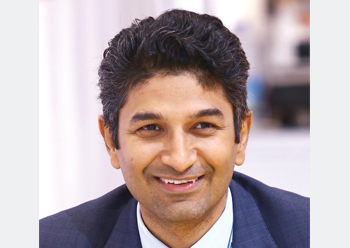 Ducab is now supporting national transformation agendas – particularly in the UAE – and is preparing to deliver even greater value to its international customers in the years ahead, Chaturvedy says. With six manufacturing facilities in the UAE, Ducab has a manufacturing capability of over 115,000 metal tonnes of high-, medium- and low-voltage cables and 120,000 tonnes of copper rod and wire per annum. The company is committed to diversifying its product range to meet the energy needs of the future. It currently offers a full range of low-, medium- and high-voltage products - high-voltage cables up to 400 kV, medium-voltage cables up to 33 kV, low-voltage power cables, control and auxiliary, wiring and lead-sheathed cables, low smoke zero halogen cables, fire-performance cables, copper rods and wires, cable components and cable accessories. High-voltage cables were developed through the Ducab HV venture, which is the first dedicated high voltage (60 kV – 150 kV) and extra-high-voltage (220 kV – 500 kV) power cable manufacturing facility in the Middle East. These cables are particularly praised by public authorities which operate within the electricity sector, Chaturvedy points out. The company also offers electrical conductive (EC) grade aluminium alloy rods, wires, and bare overhead conductors through its joint venture Ducab Aluminium Company (DAC). DAC, a joint venture between Ducab and Senaat, was set up to cater for the growing market for aluminium. It was officially inaugurated in January 2018 in the Khalifa Industrial Zone of Abu Dhabi (Kizad) following an investment of $60 million for buildings, machinery and infrastructure. DAC will manufacture 50,000 tonnes of high-quality electrical grade aluminium rod and overhead conductor per annum once it reaches its full capacity, supplying to both local and international customers. Ducab has achieved a number of local, regional and world firsts on its path to success. Chaturvedy elaborates: “Ducab Copper Rod Factory opened in 2008, as the first copper casting plant in the UAE. In fact, Ducab was the first in the region to have both aluminium and copper rods. In 1997, Ducab was the first cable manufacturing company in the world to become ISO 14001 certified, to receive ISO 9001 quality management standard certification and to be awarded the Emirates Quality Mark Award, he says. A smart grid as envisioned by Ducab. Ducab takes pride in providing a quality-assured product range that adheres to strict global standards and believes that, apart from ensuring its products meet these standards, the company also has a responsibility to educate others on the importance of using standards-compliant electrical wiring and cables, Chaturvedy continues. “All of Ducab’s factories are ISO 9001 certified. Since 1979, Ducab has been recognised for its environmental, health and safety standards, the quality of its products and its commitment to excellence, with numerous certifications: Ducab’s quality management system has been certified to ISO 9000 since 1993; Ducab environmental management system is certified by Basec (British Approvals Service for Cables) to ISO 14001, and Ducab achieves extraordinary results in the industry without compromising the safety of its employees, with its health and safety system certified to Ohsas 18001,” he adds. Ducab recently announced a state-of-the-art fire testing laboratory specifically built for the Ducab FlamBICC range of fire-performance cables, according to BS EN/IEC standard and Ducab NuBICC nuclear cables tested in accordance with IEEE International standards. It is equipped with the latest laboratory, operated by highly qualified and trained manpower and offers various fire and smoke tests in accordance with BS8519 Code of Practice. As one of the largest industries in the UAE and the region, Ducab’s impact in public life and the UAE economy is multi-dimensional. “Ducab products touch millions of lives every day through use in residences, public spaces, and infrastructure across the UAE and far beyond. Ducab operations reduce the UAE’s dependence on imported cables, while also helping the country earn foreign currency by exporting overseas, to customers in more than 40 countries across the globe,” he says. Not only does Ducab contribute to the economy through its products, but it does so by providing employment opportunities for talented Emirati nationals, too. Committed to the Emiratisation vision of the UAE, Ducab has achieved several impressive milestones with UAE nationals representing 67 per cent of senior management. Its mission remains to provide customers with total quality excellence, in both product and service. Ducab has also made significant inroads into the Far East, the Subcontinent, Africa, and Europe. In the last 38 years, Ducab has been part of major projects domestically, regionally and globally, positioning it as one of the key players in the cabling industry. Over the past years, the company has supplied electrical cables to a number of landmark projects in the UAE, including the Burj Khalifa, Dubai Metro, Emirates Palace, Burj Al Arab, Atlantis the Palm and Yas Marina Circuit. Ducab has also built a global presence by supplying power cables to projects such as the Ras Gas Project and Dasman Hypermarket in Qatar, Central Bank of Oman, and Dilmunia health island in Bahrain, among others. Chaturvedy sees major growth opportunities in the region, given that the cabling industry ultimately is a key enabler of development in industry and society. “In the Gulf, development is underpinned by economic diversification as well as new directives for infrastructure investment and the construction industry is playing a pivotal role in bringing these ambitions to life. And it is the cabling sector – which has embraced a renewed emphasis on reliability, innovation, and sustainability – that ultimately powers stronger connections between industry and society,” he concludes. Every week, Ducab produces 10 million m of insulated building wire, which is enough each month to circle the globe. Its facilities occupy an area of 880,000 sq m, which is equivalent to the length of 81 football fields. The copper rod factory, the first continuous copper casting plant in the UAE, can produce up to 110,000 tonnes of copper rod per year, which is equal to the weight of more than 600 Boeing 777-400 planes. The company has won the Dubai Chamber CSR Label Award five times in a row. Its plant in Dubai has one of the longest CCV lines in the world for the manufacture of 11-kV and 33-kV medium voltage cables incorporating the latest in production machinery and testing equipment. Ducab has a multi-cultural environment with more than 1,650 employees, comprising 26 different nationalities with UAE nationals involved in all aspects of the operation. Collectively, its employees have over 10,000 years of manufacturing experience. Ducab provided more than 3 km of cabling to power up the world-renowned Burj Dubai. This length of cabling stretched end-to-end would be longer than the Golden Gate Bridge in San Francisco.